If anyone has any knowledge of septic tanks I would really appreciate some help. I am building a single storey family home with 4 bathrooms all down one side of the house, with about 13m between the most distant ones. The floor of the living space is about 60cm above the surrounding land. 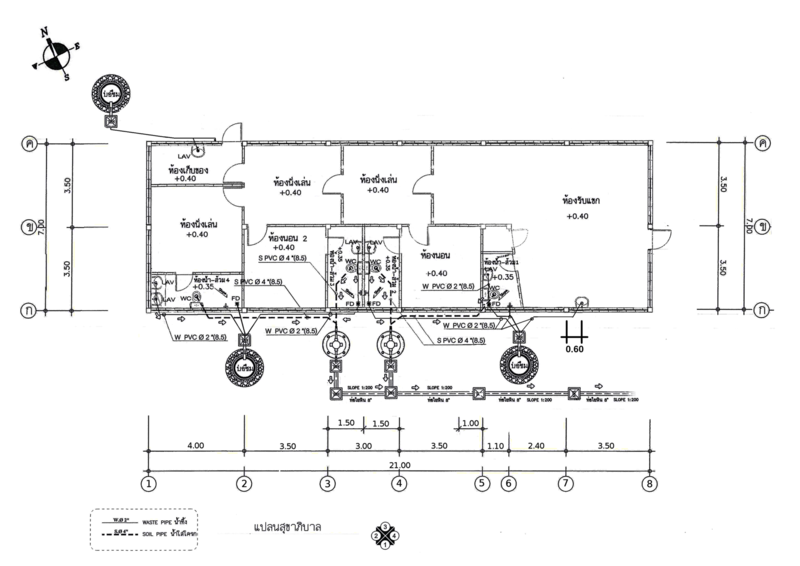 On the plan attached, the architect included two septic tanks, both near to the most central bathrooms. This seems odd to me. If including two I would put each equidistant between the 2 bathrooms each would serve to minimise the distance from any one toilet. Anyway, my question is, could I just use one larger septic tank where he showed 2, or should I use 2? If 2 should they be where he has shown, or where I have suggested? Also, the size and types of tanks are confusing. Any suggestions on size(s) and particular models/types? For anyone who is interested, here are a few shots from Sketchup showing the house. The "wall of windows" faces north. The two "odd" walk-through living rooms are attached to our two teenage boys' bedrooms - for noise isolation when playing video games! but still with us walking through to get to our own bedroom or the laundry room - so not complete privacy in the lounge areas.... No corridors - I hate them! Designed for a simple build and to suit our families needs. Being built as I type, just pored the ground beams a couple of days ago. Happy to share the plans and the sketchup file if of interest to anyone. It's also designed that the end distant from the open plan lounge can be split off into a granny flat in the future, creating a small 2 bedroom dwelling with a small living room and kitchen of its own. If I were building for 4 toilets I would use a single septic tank. I have no idea if what I did is correct. We have a public place, with sometimes a few hundred visitors. When they arrive here they always need to use the toilet at the same time. Mostly our guests toilets are unused. So I installed two 1.000 liter sceptic tanks, in serie. The idea is when the toilets are used very often in a short time, tank 1 overflows in tank 2. When they are not in use for a long time (sometimes we do not have big groups in a period from 2 months) they have time to proces the waste. As said I am not sure if this thinking is correct, but the toilets are in place now several years, and the water what leaves the sceptic tanks, also when we have a big group, is relatively clean, and without a smell. I think his two septic layout is as good as it gets....but one tank is also going to do the job with some thoughtful drain runs. The most important thing about drain design is to try and keep runs as straight as possible with as few bends and junctions as possible as thats where the problems arise. A septic tank may seem easy to connect to with some spare inlets but chances are you will be fi ding bends to reach them. Your design has one oblique junction on a straight run, i would only change an oblique for a more sweeping one. A 1000litre tank is more than adequate for 2/3 persons living in a house, but I have read somewhere that you really shouldnt drop to an 800l whatever the guidelines say and tbh theres only a few hundred bht difference. Some great advice from you all, thank you. Some real food for thought there on the bend avoidance. Back-up. In case one of the septic tanks or the pipe leading to it gets blocked/clocked up, we will still have one working toilet. The "golden rule" is to use 45° PVC for bends (ie: 2 to make a 90° bend). Some very good advise has been posted regarding Septic Tanks when building a house in Thailand. The OP may in fact get technical advice for himself or his Thai home builders should he meet with a representative of DOS septic tank company. Most any home builders merchant store should have a DOS tank representative at that store. I have three 1000 liter DOS septic tanks installed at my home in Buriram for over ten years with zero honey bucket truck visits. A big tank will treat the waste better than multiple small tanks. The size of the septic tank should ensure minimum 4 day retention time. In the 3rd world you sometimes come across this crazy rule of thumb 1000 liters or whatever the building store has in stock. Ignore this. Undersized tanks will not sufficiently treat the waste, gunk up the drain field, pollute the groundwater, and/or need pumped too frequently. For reference the building codes of Florida, a similar climate to Thailand, require a minimum tank size of 3400 liters. But keep in mind that tank is accepting greywater and blackwater combined, your system may be different. Again 4 day retention time is the key. Anywhere a drain pipe bends install a cleanout. Drain pipes 4 inch in size should be pitched 1/8 inch per foot. Not the slightest bit more (unless vertical). Not less. People don't understand if the pitch is a little too steep it is not able to float the solids down the line and clogs up. How do you calculate the retention time? So a 1000 litre tank is too small? For a very large family I'm sure it could be. Our water usage last month was about 80 cubic metres I doubt that of that the black water more than 1 more likely less than 0.5. So with us it is probably a 80~1 ratio maybe 40~1. Given the sizing you are quoting for Florida a 1000 litre tank is probably very much larger than any family needs in Thailand. You are not considering the working volume of a septic tank (the liquid portion) is smaller than its total volume. As a tank is used its working volume diminishes due to increased sludge inside. Once you pump out the sludge, the working volume goes back up. So add sufficient space inside so you don't have the hassle of frequent pumping or worse yet forget to pump and end up plugging up the drain field with untreated waste seeping into the groundwater. If calculating by hand is too much of a bother, just choose from a good building code. The size will be sufficient to handle all common residential situations. Bigger is better. Better waste treatment, less pumping. You are not considering the working volume of a septic tank (the liquid portion) is smaller than its total volume. As a tank is used its working volume diminishes due to increased sludge inside. Well considering that I was calculating on a volume of about 500 litres, I don't think there are tanks that small, it certainly is smaller than the total volume of any tank I've seen. my brother has a septic tank in a country that does have grey water going into it and his tank has not been pumped in at least 30 years. A correctly functioning septic tank may never need to be pumped. A correctly functioning septic tank may never need to be pumped. Certainly compared to the Thai cesspits, septic tanks do an excellent job of breaking down the solids and are a much more hassle free and environmentally sensitive solution. And toilet paper is designed to break down in a septic tank. That's why you never throw things like paper towels inside. Still I would imagine there will be some buildup over time and it would be good to at least check the sludge level every so many years. You may like pumping frequency guidelines. It's in the link right above your post. Certainly compared to the Thai cesspits, septic tanks do an excellent job of breaking down the solids and are a much more hassle free and environmentally sensitive solution. And toilet paper is designed to break down in a septic tank. That's why you never throw things like paper towels inside. Still I would imagine there will be some buildup over time and it would be good to at least check the sludge level every so many years. Yo﻿u﻿ may like pumping frequency guidelines. Virtually all of the questions in that link relate to a system that includes grey water so it is useless in a situation that most people here have where it is only black water that goes into the septic tank. The reason for its being redundant is that because it presumes grey water inflow (that is always many times greater than black water) all the advice is predicted on that. I have found "A dissertation submitted in partial fulfillment of the requirements for the degree of Doctor of Philosophy in Environmental Engineering and Management" that gives some accurate sizing suggestions though it's focus is on the temperature of treatment. The information is that in 2015 based on probability older toilets 20 litres per day was usual and a black water only septic tank of 600 litres was correctly sized for a 6 person house. Since it is a doctoral thesis and 159 pages long I haven't seen if it gives anything related to a need to pump solids or if there is anything related to oversizeing and any effect that could have.